Novice or Experienced People Requiring WHMIS 2015 Training in the Workplace. Site Specific and On Site Training Available. Who is Responsible for WHMIS 2015? What is a Controlled Product? On February 24, 2015, WorkSafeBC’s Board of Directors approved amendments to the Occupational Health and Safety Regulation. These regulatory amendments to the OHSR came into force on the date the consequential amendments to sections 5 and 6 of the Workers Compensation Amendment Act, 2015, Bill 9, came into force. This occurred on August 4, 2015. 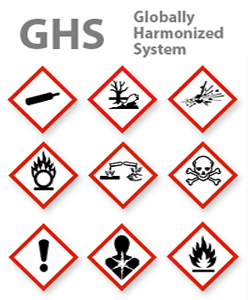 These changes harmonize with the Government of Canada’s implementation of the Globally Harmonized System of Classification and Labeling of Chemicals (GHS). The GHS does not replace WHMIS. The existing WHMIS requirements will align with the GHS elements and are now called WHMIS 2015.